Waking up to a cold house is never a welcomed event and can really set the tone for the day. Allright Plumbing and Heating are the best HVAC contractors to take care of any furnace repairs, service, and installation in Colorado Springs to provide you with a smile for the rest of the day. Our furnace service technicians are extensively trained to diagnose and repair your heating appliance, whether it is a forced air furnace or a hot water boiler. We service all furnace makes and models in the Colorado Springs and outlying areas. Averaging over 10 years of experience, our technicians strive to provide the consumer with prompt, friendly, and professional service. If your heating appliance is outdated and costing more to operate than is necessary, or is unsafe to operate, call Allright Plumbing and Heating at (719) 597-1099 to discuss the best furnace replacement options for you and your Colorado Springs home. Our free* estimates will provide you with the most cost-effective and best choice for your heating needs. We won’t try to sell you the most expensive model, but we will offer you a variety of choices to meet your budget and heating needs. Our estimator has over 30 years of experience in heating and cooling homes in the Colorado Springs environment. Trust Allright Plumbing and Heating to give you an honest and informative quote for your furnace repair, service, or installation in Colorado Springs today. Fill out the form to the right to schedule an appointment online.You can also call immediately to schedule an estimate at (719) 597-1099. Why Do I Have To Have My Furnace Serviced Every Year? With Colorado’s weather, you never know when the next cold day will hit. Being without heat on those cold days is not an option. One way to escape those “no heat” experiences is to maintain your furnace or boiler. 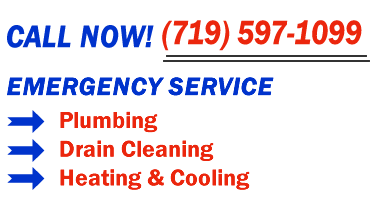 Allright Plumbing and Heating has trained and certified heating technicians that can perform furnace service and cleaning in the Colorado Springs area to prevent simple problems from occurring during those cold days. Whether your Colorado Springs home needs a furnace repair, service, or installation, we are the experienced HVAC contractors to help you rest warm and easy! Having your furnace or boiler serviced can prolong the life of the system, save you up to 20-30% in energy bills, and decrease health risks by identifying possible gas or carbon monoxide leaks. All furnace manufacturers recommend a furnace service annually. Many have language in their warranties excluding damage to the unit caused by improper maintenance. Trust Allright Plumbing and Heating for boiler or furnace maintenance, service, and installation in Colorado Springs to assure your unit is working to its optimal level. Call today to schedule a service at (719) 597-1099.